Collect up to $500 free when you download and signup to bwin Poker. This offer is a 100% 1st deposit matching bonus. Unlike most online poker rooms, WSOP focuses most of its promotional activities on supporting its offline tournaments and the opportunity to compete for the coveted WSOP Championship bracelet at the final table in Las Vegas each November. The big prize is a $10,000 seat at the 2011 WSOP Main Event plus a Vegas hospitality package that includes air flight, hotel accommodations, and spending money. Nine such prizes are offered. The World Series of Poker (WSOP) is virtually synonymous with championship tournaments. It comes as no surprise, then, that its web site covers just about everything poker-related, from tutorials for beginners to opportunities to play online against the stars of the sport. WSOP.com is also affiliated with two of the top names in gaming, Harrah’s Entertainment and CaesarsCasino.com. Harrah’s owns not only the WSOP franchise and a number of Las Vegas properties but also the London Clubs International family of casinos. Exploring the wsop.com web site is like touring the inner sanctum of the poker world. News about the winners of the latest WSOP tournaments is prominently featured, which includes not only the lead-up to the WSOP’s annual gathering in Las Vegas, but also the many tournaments of WSOP Europe and the WSOP Circuit. Events are held weekly, and registration is available online to residents of Europe. The WSOP Academy offers a 100% interactive poker training. As instructors, it features some of the biggest names from WSOP events, such as World Champions Joe Navarro and Phi Helmuth. The first trial lesson is free, and paid tuition leads to official certification in poker skills. Three different ways to play poker are also offered at wsop.com. 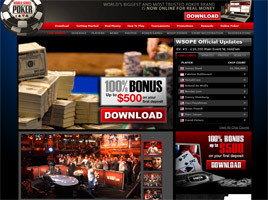 The downloadable software allows access to the WSOP main poker rooms. An application created exclusively for use on Facebook opens the possibility of winning a “virtual” WSOP bracelet. And a mobile application called “Hold’em Legend” extends poker playing to the iPod Touch, iPhone, and other mobile devices. Press releases, tournament updates, player profiles, the WSOP history, lists of bracelet winners, poker columns by experts, and an email newsletter are just a few of the resources that can be reached with just a click from the WSOP homepage. Those interested in improving their play will also find sections on how to play poker, poker hand rankings, and information on the WSOP Hall of Fame as well as tournament rules. Those interested in traveling to a WSOP-sponsored event will appreciate the direct links to the WSOP hotel reservations system on Harrahs.com. Bookings made online come with a “Best Rate Guarantee.” If a lower published room rate is found, Harrah’s will not only match that rate, but also provide an additional 10% off the lower rate. To qualify for their championship opportunity, new players simply log in at wsop.com, download the site’s poker software, set up an account, and register to play in one of the many daily “Stage 1” satellites offered every hour on the hour between 3pm and 11pm Eastern Time. There is no fee for entry. Existing members may enter, too. The top 10% of all players from each daily satellite are invited to participate in that week’s “Stage 2” Sunday satellite, conducted every week for nine weeks. The winners of those nine tournaments become the “Online November NINE” invited to Las Vegas. “Stage 3” is a live Sit ‘n Go conducted on the stage of the Rio Hotel, home of the annual World Series of Poker. The 2011 event is scheduled for 9 November. VIP seating is provided at the filming of the 2010 WSOP final, too. Only the Sit ‘n Go winner moves on to “Stage 4”—actually playing in the WSOP Main Event for a shot at the prestigious WSOP bracelet.